I had a decent practice session this weekend. 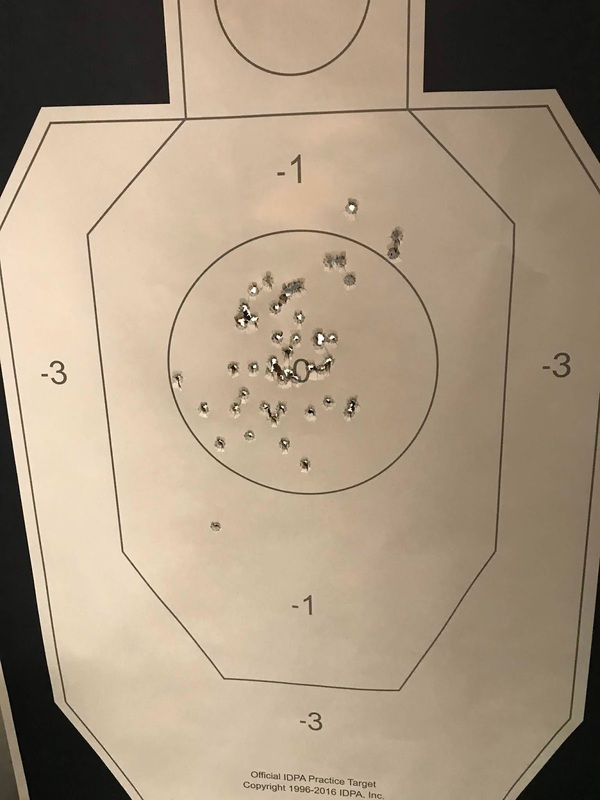 My goal was to work more on sight acquisition with the new sights on the gun, and familiarize myself with what is an acceptable sight picture using target focus. Starting out at 10 yards, I ran through 50 rounds, shooting at a moderate pace. Firing just one or two shots per string, a few shots drifted outside the -0 zone. Still, I was generally pleased. Emboldened perhaps, I pushed the next target out to 20 yards for a slow 50 rounds. The hits weren't as good, but generally stayed within the -1 zone. The shots tended to be low, so I made a note to work on that some more next time. Next I moved to the opposite extreme and hung a Dot Torture target paper at 3 yards. I've struggled with this drill of late, mostly because of a lack of patience when trying to shoot slowly. I had a miss on a transition shot between circle #3 and #4. I might blame that on the green laser dot from one lane over repeatedly crossing my target. After the miss I knew I wouldn't beat my 49/50 record so I shot the rest of the drill quickly, to finish 47/50. I typically limit my indoor range practice to 150 rounds, but an extra box of ammo had somehow snuck into my range bag. :-) I finished the session shooting ten, 5 round strings, pushing as fast as I could get a flash of the red fiber dot. The first 20 rounds were fired from extension at a stationary target. For the final six strings I shot from low ready, at a timed target set to a three second exposure. Looking at the target after those runs, although most were -0, the hits were generally concentrated in the lower left quadrant of the center circle. When I push the speed, I'm apparently pushing the gun to the left. During the Brandon Wright pistol class, Brandon encouraged me to use a little more trigger finger when we were working on fast trigger presses. I will be sure to pay some attention to that next time. Overall, I found this practice to be both beneficial and fun. One can't ask for much more than that.